Tremron Group's interlocking concrete pavers and retaining walls meet or exceed the requirements of ASTM C-936 and ASTM C-1372. Tremron Group warrants the structural integrity of its products for 25 years from the date of installation. This warranty does not apply to splitting, chipping, spalling or other breakage that may be caused by impact, abrasion or improper use. Efflorescence may occur and is not covered by this warranty. This warranty is only valid if the material is installed in accordance with the guidelines of the ICPI(www.icpi.org) or the NCMA(www.ncma.org). This warranty is for residential construction only and does not imply a warranty for commercial applications. Tremron Group's obligation is limited to providing replacement material at no charge. Tremron Group will not be responsible for any replacement labor or freight. The original proof of purchase is required. Color matching is not guaranteed. Due to the variances in the printing process, all product and color appearances may be different than as displayed in this website or brochure as well as may vary in appearance from one brochure to another. 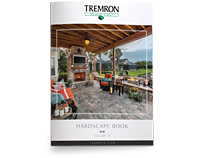 Tremron Group makes no claim or warranty as to actual product or product color appearance in comparison to what is displayed in this website or brochure. Products and product colors naturally vary from plant to plant as well as from one production run to another. Please visit your local Tremron Design Center for product samples.